They're referring to them as Footed Pilsner or Retro Sling Glasses. Here is a somewhat similar glass, they are calling vintage Mid-century. The OP is a pilsner, used for beer drinking. It could be MCM, vintage or made 2 weeks ago. There is no way to determine age. A set would be 6, 8 or 10. A single, such as yours might be worth $5.00. As stated, here is a SOMEWHAT SIMILAR glass....I was only getting an idea of what kind of drinking vessel I was looking for....and I called it a Footed Pilsner, which is for beer. You really should try taking a photo of a glass against a solid background colour. Plain Black or White would work well. Also, sometimes pouring a dark, opaque liquid (such as black tea as coke with its bubbles may be too distracting in the design) into the glass to eliminate see through and also helps to emphasise the etched design on the surface of the glass. Ensure you have sufficient lighting to show the angles in the glass, or a suitable flash. Great tip will do that. 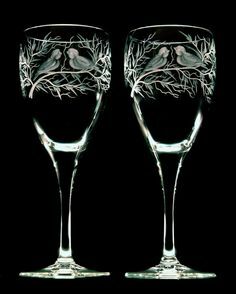 I’m leaning towards a dram glass or penny gin (sham dram) these sorts of glasses where introduced in England during the regency and Victorian era when gin was popular. The idea that the glass was made to look like it held more gin than it actually did. Or could be a schnapps glass but they don’t tend to have a long stemWhat’s your thoughts Michael. Telling us the dimensions of the glass itself would also be very helpful. Perhaps you could use a familiar object next to it for scale? So, it is purposely deceptive in hold much it holds? Such as the 19th century glass from the website above. Do you have a photo of the marking? I wish you would provide as much information and details in your First post. Adding important features later wastes time. Molly and I both suggested "pilsner" for beer which with the new, additional information I believe is incorrect. The simple comment about looks like it holds more than it does now makes sense. In your pic I could see a glob of glass but couldn't figure out what it is. Now I know. I can also date it, more or less, and value it. You could have put that comment in your Original Post (OP) but you didn't. You should provide dimensions, metric and inches, and how much liquid it holds. Roll up a piece of black paper and insert into the glass. Use white if the glass is colored. Cover your platform, foreground and background with a white towel or sheet. Did you notice in your pic that your glass has brown and black stripes?